It's human nature to want to know how much your friends and neighbors make every year. But straight-up asking that sort of thing is a really quick way to make everyone very uncomfortable. Though, if you've ever wondered how your paychecks stack up next to the rest of the working world around you, you'll want to take a peek at this new chart, which reveals exactly how many people can be found at every income level in America. 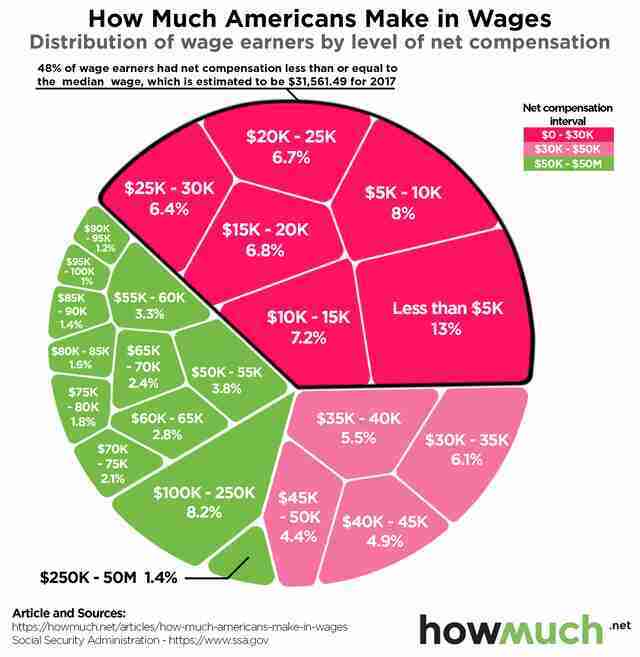 The enlightening new visualization was made by the team at HowMuch, who organized the distribution of earnings in a nifty chart by representing various levels of income in bubbles relative to the size of the population that earns them. Beyond giving you a sense of where you fall in the earnings spectrum, it's also quite revealing to see just how many people earn shockingly little every year. In fact, according to the stats, a whopping 48% of the working population earned less or equal to the median wage in America for 2017, which was roughly $31,500. 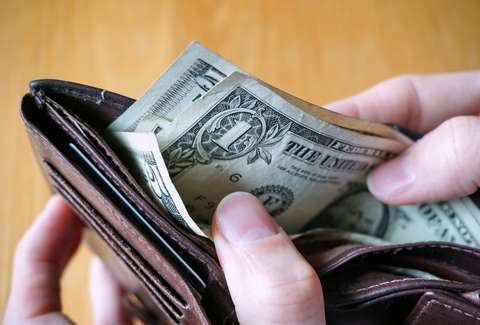 You can also see just how many people earn no more than $50,000 every year, compared to the small slice of the population (9.6%) that's raking in $100,000 and up. The data featured in the chart come from the latest available information from the Social Security Administration, which tracks net income numbers (after taxes) for all workers. However, it's important to note that the SSA numbers include literally any and all wage earners, which means everyone from part-time workers, to college students, and even teenagers with after-school jobs are included, so that skews the numbers a bit low. Also, the figures represent individual earners, so these don't necessarily reflect the household earnings for a lot of couples and families. Still, it's a bit unnerving to see the reality of income inequality in America in such a stark presentation. And when you compare it to the countrywide stats on what you need to earn every month just to rent a place to live, it's even more alarming. But, hey, if you're still in school, you still have a chance to switch up your major to one that's most likely get you a good-paying gig once you graduate.